Surrounded by an olive grove Koronio Villas is 0.6 mi from Kalamaki beach and features stone-built villas with fireplace and private pool. Each has free Wi-Fi and patio overlooking the Libyan Sea and the Idi Mountains. 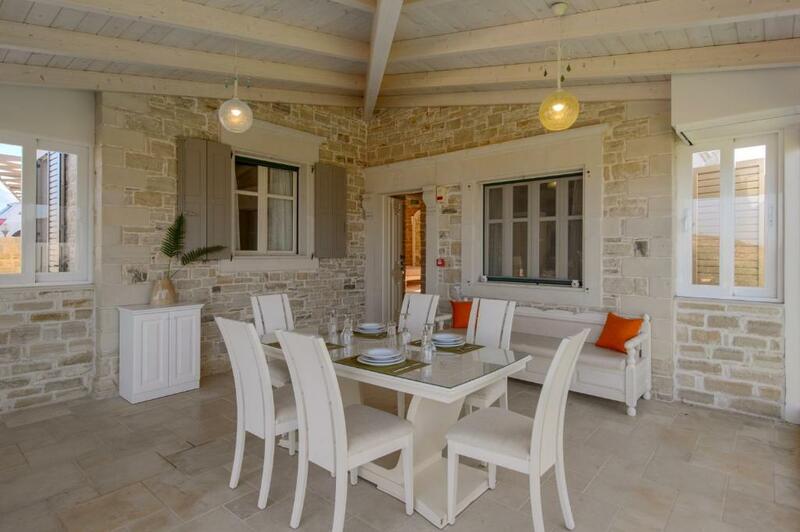 Featuring stone walls and furnishings in white hues, all the air-conditioned villas at Koronio have a kitchen with cooking facilities, stove and dining area. A seating area and TV are included. The village of Kalamaki is 0.6 mi away. Restaurants are within 2,650 feet. The ancient site of Phaistos is at a distance of 1.9 mi. Guests can visit the lively Matala 3.7 mi away. When would you like to stay at Koronio Villas? 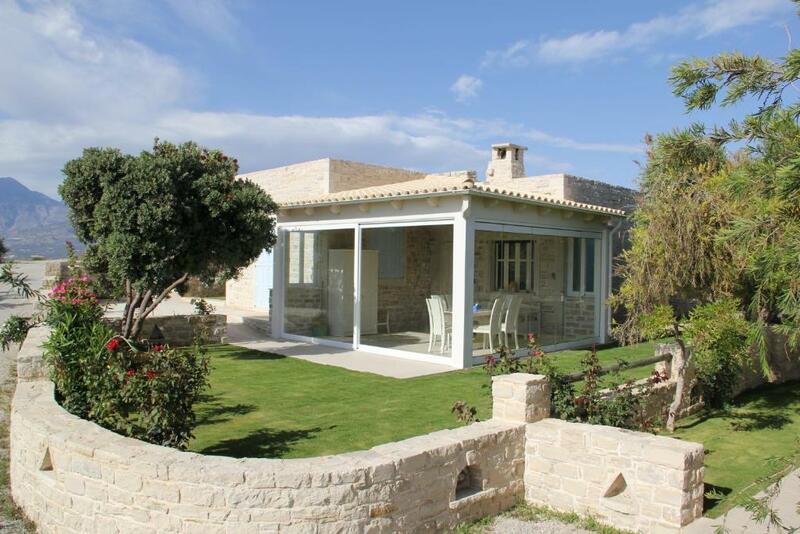 Located in an olive grove, this fully equipped villa has a private pool, fireplace and free Wi-Fi. Offers patio overlooking the sea and mountains. 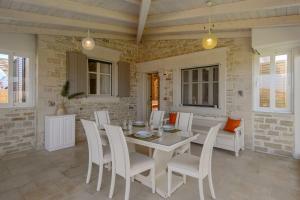 Villas Koronio are located on a hill between Kalamaki (approx. 1.5 km distance) and Kamilari. We have created for you 3 luxury villas and an apartment with Cretan original design, in an olive grove. The quietness, the comfort and the breathtaking views of the Libyan Sea and the Ida Mountains will sure delight you. The houses were built with natural stones, using wooden elements. The complete equipment of the houses meet the highest standards and offers you everything you need to spend a comfortable stay. Enjoy your «own» four walls, the large beautiful garden and marvel at the amazing sunsets in the bay of Kalamaki from your prime seat. Over the years we have gained many regular customers and friends. We always adapt to the needs and demands of our customers and guests. In our place you will find the right combination of friendly atmosphere and professionalism, modernity and Cretan traditions and style, which will make your vacations in Crete a relaxed, friendly and wonderful stay. Kalamaki is a small village, situated at the sparsely populated south coast of central Crete - at the edge of the Messara, between Agia Galini and Matala, directly on the Libyan sea. Kalamaki, Agios Ioannis and Kamilari, form a community and have about 450 inhabitants in total. The nearest town is Timbaki (6 km) and a little further away is Mires (15 km). 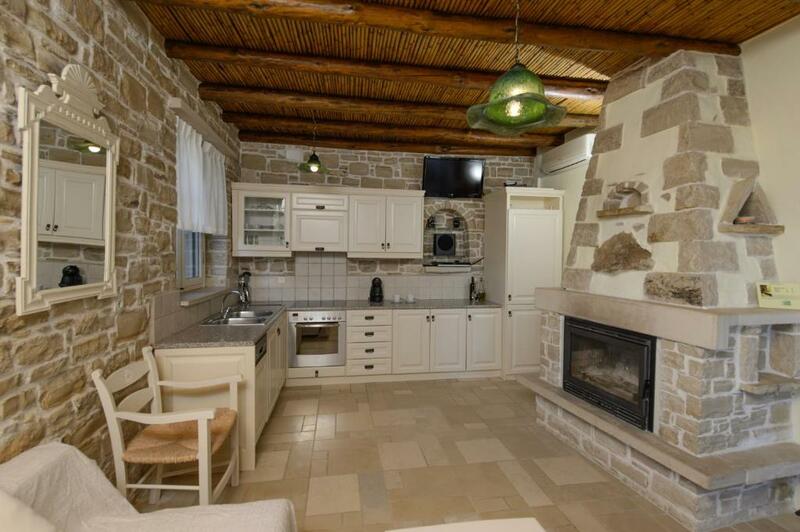 In Kalamaki you will find all the small things you need for daily use in your holidays. There are mini markets, a bakery, shops and beach needs, newspapers, etc. In Timbaki and Mires there’s a bigger range of shopping possibilities available, if you need something special. There are also doctors of various specialties and pharmacies, a hospital, banks as well as a post office. The weather here is at its best nearly all year with an average of 12 hours sunshine per day during the summer months. 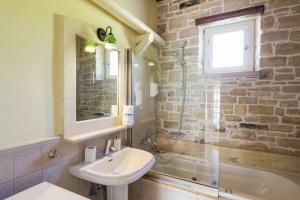 House Rules Koronio Villas takes special requests – add in the next step! Koronio Villas accepts these cards and reserves the right to temporarily hold an amount prior to arrival. Please inform Koronio Villas of your expected arrival time in advance. You can use the Special Requests box when booking, or contact the property directly using the contact details in your confirmation. We need at least 5 reviews before we can calculate a review score. If you book and review your stay, you can help Koronio Villas meet this goal. Just be aware you will need a car to get to local places unless you are very fit as it is so hot (we went in June) that walking far isn't really advisable except for early morning / late evening and cycling in the hills isn't something we even attempted for the same reason. The whole villa was lovely, very thoughtfully designed and built to a very high specification, all with natural, local materials. Inside it did not seem huge at first, but there is a great deal of outdoor area and in combination it resulted in a huge variety of living spaces. The outdoor pool, jacuzzi dining and kitchen area was superb and private yet with great views of the mountains. 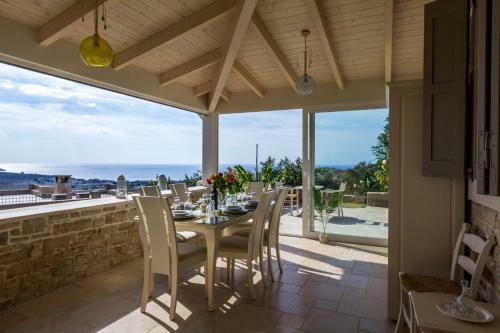 On the other side, another convertible outdoor dining room and gardens have great views of the sea including the eastern cliffs of Matala and the two Paramadia islands. 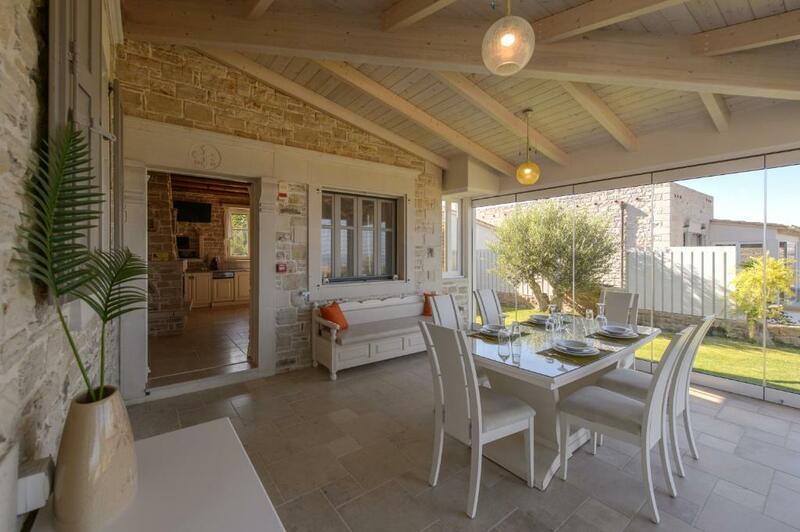 Inside, a large kitchen / dining / lounging area, two decent bedrooms and a bathroom all made with gorgeous local stone and with air con, double shutters and fly covers were very comfortable, light and airy. The hosts went out of their way to give us great customer service, and were very quick to respond when we couldn't figure out the safety deposit box and also when we managed to leave the hire car battery lights on overnight and drained the battery; they arrived within minutes and were extremely helpful and generous in their hospitality, with the owner himself coming to ensure we were happy. The nearest village of Kalamaki, just a short walk down the hill was very cute, and had good beaches, bars and restaurants and has a gentle, quiet pace to it with good shops also. Matala is a 15 minute drive which is a great little hippy-esque town with a bit more energy and amazing cliffs, superb snorkelling in the bay and more bars and shops etc. Tympaki is also close by which has a great market if you want to endure the noise, smells and traffic of a much larger town - it is worth it to get some of the great local produce. All in all, it was an awesome holiday and we couldn't recommend it more. Only thing I didn't like was the fact I couldn't take this villa with me ! The location of the property is amazing, full amenities and the extraordinary private pool. The host is a true person, very friendly and always ready to help, fast and discrete cleaning ladies. An original Cretan vacation, this villa is so close to the sandy beaches and yet can provide high levels of privacy. I Definitely suggest it and be back again.